Trampolining is a fun way to get fit for both parents and kids! It is also one of the ways to keep kids busy and entertained. Here we review one of the safest trampolines in the market. The AlleyOOP jumping mat is securely attached to the poles using the suspension system that flexes when a user makes an impact on the enclosure net. The trampoline frame, poles and springs are covered with thick foam padding for extra safety. This padding is further covered by thick plastic that prevents sun damage. 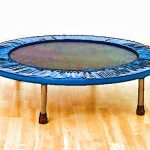 The AlleyOOP utilizes JumpSport’s patented overlapping door entry system, which the users can never forget to close after entering the trampoline. The double bed system, which can help cushion awkward landings combined with high performance springs, makes AlleyOOP the best bouncing trampoline. You might sometimes feel the second bed while jumping. The long stretch high performance springs provide smooth yet powerful jump. Diameter of the trampoline is 14 inches. The trampoline built up of high quality parts. It has integrated safety net enclosure. It has a safe design. Buyers should be prepared to spend several hours installing the AlleyOOP trampoline. Installation takes time because the company has created additional safety features. However, detailed instructions are provided. It takes anywhere from two to five hours to install depending on the number of people involved. You can also take professional help if you are not hands on. While it is expensive, it is worth buying due to good safety aspects and durability. AlleyOOP DoubleBounce is rated for a maximum weight of 250 pounds per person for a standard 128-spring configuration. In addition, the total combined weight should not exceed 800 lbs. This trampoline provides a low impact and a high aerobic workout. It’s a fun center that will get kids outside and in shape. Suitable for gymnasts, skateboarders, skiers, cheerleaders and extreme sports athletes. AlleyOOP’s forest green finish blends naturally with your landscape or yard. The distance from ground to the jumping mat is about 40 inches. Most users reported a good customer support experience with JumpSport. The AlleyOOP trampoline is not anchored to the ground and risks flying off during a stormy weather. However, JumpSport sells the anchor system separately for this trampoline. Initial costs might be higher but this trampoline with its quality materials and safety features will last for years. Most reviews about this product are positive and users are extremely satisfied with this product. Toddlers should always be under adult supervision while using any trampoline as any determined child can go in spaces between springs. The AlleyOOP DoubleBounce uses spring size of 10 inches while the older VariableBounce model had 8.5-inch springs. Although installing this product takes a considerable amount of time, the result is well worth it. Overlapping entries are the best because the children can never forget to close the door behind them. The net is thick and comes with a five-year warranty. Strong top and bottom net connections and backup straps make this the most secure and robust system. Thick padding covers the springs and the frame well. There is plenty of room for kids to stand on the side of the trampoline while they wait for their turn to bounce. 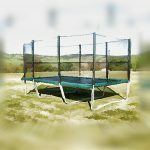 The AlleyOOP 14’ DoubleBounce Trampoline is very stable due to the secure pad, net and heavy-duty frame. It will not budge when you make an impact on the enclosure net and on the double bed. The frames are made up of galvanized steel and powder coated to resist rust effectively. AlleyOOP’s frame and enclosure come with a lifetime warranty. The double bed system softens landings and makes the trampoline safer for multiple jumpers. The bounce feels great despite the two layers of beds due to high-end springs. 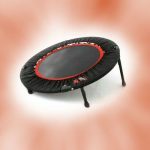 The AlleyOOP DoubleBounce trampoline has a controlled, smooth and a wonderful bounce that’s easy on the joints. Dividing the springs between an upper bed and a lower bed creates a shock absorption zone that is fifty percent more forgiving than a standard single trampoline bed, so it puts just half as much stress on the body. AlleyOop further enhances the safety by controlling the airspace between the beds to create an air shock absorption system, which helps to cushion falls like an airbag in a car. 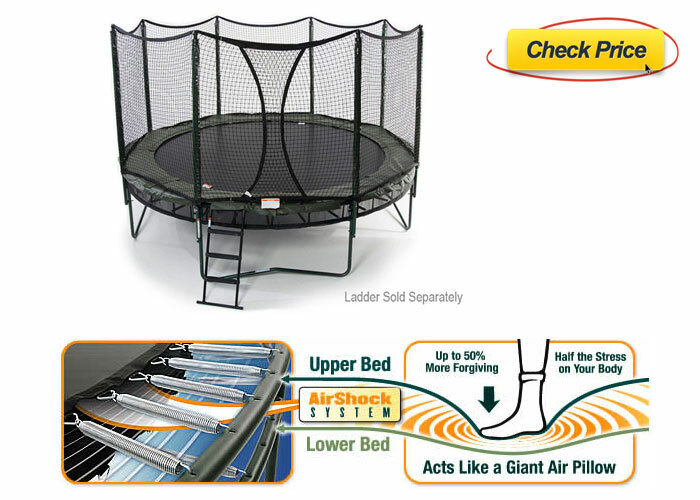 AlleyOOP’s high quality springs are longer and larger in diameter than low quality backyard trampolines. Therefore, they stretch further and are more forgiving. There is one more significant safety advantage offered by AlleyOOP’s double bed system that a single bed can’t match. The double bed shock zone helps prevent injuries that can result from multiple jumpers. The safety net enclosure is also engineered for performance. The triple fail-safe design uses three patented support elements to hold the net in place each of which is strong enough to stop a jumper from falling off. First, a top strap tested to 3500 pounds is woven through the net and is attached to each pole. Second, the netting is wrapped around the outside of the poles, so if the top strap breaks during an impact, the net would not collapse. Third, pull straps and shock cords attach the net to each pole creating a suspension system. 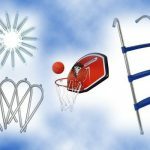 There are many different accessories available for this trampoline like the basketball set, the weather cover, anchor kit and the ladder. Besides this, a performance package can also be purchased to further enhance performance training for professionals. 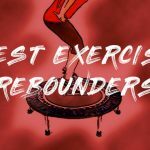 The NEW version of AlleyOOP called Power DoubleBounce trampoline system has a 128 spring standard configuration to optimize the trampoline for jumpers of different weights and abilities. The Power DoubleBounce offers a power upgrade of 64 additional springs for accommodating additional jumpers. The AlleyOOP trampolines features power bounce technology, which improves the bounce height that is perfect for gymnasts and cheerleaders to tumble on. The net of the trampoline is thick and extremely secure and you do not need to worry about falling out. The trampoline is also great to practice jumps and flexibility for cheerleaders who are working on getting higher jumps. Overall, this is a quality trampoline with an amazing bounce. You will also love using the basketball backboard accessory, which needs to be purchased separately. 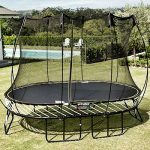 With plenty of standing room, with easy to grip net, the overlapping door entry, cushioning double bed technology, redundant safety net system, fun basketball backboard this is a must buy trampoline for adults and children. 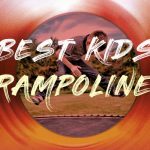 We have also reviewed the best mini trampolines for toddlers and kids here.